Standard servos are found in radio controlled model aircraft boats and cars, their output shaft can be positioned by means of an electric motor and a feedback control. They have limited range of movement, with the shaft typically limited to 90°. Operated from a 4.8-6v supply the shafts position is dictated by a signal pulsed at approximately 50Hz at 3-5v. 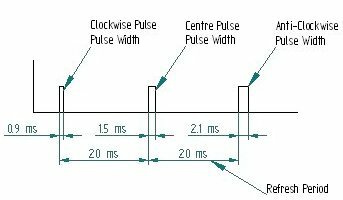 The width of the pulse relates to the position of the shaft, such that 1.5 millisecond pulse gives a centre position, 0.9 millisecond pulse gives the extreme anti-clockwise position and 2.1 the extreme clockwise position, with other positions achieved by differing timing. 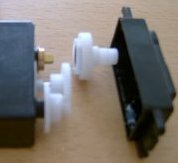 Common servo connections have Black, Red and a Yellow or White coloured wires. Red the positive supply, is best kept separate from the controllers supply, for controller reliability. With the servo under load, it's possible that the motor within will cause a voltage drop, due to the current drawn, causing the controller to reset under brown-out conditions. Black the negative, 0v, supply must be common with the controllers supply to ensure that the signals have the correct reference voltage. Finally White, or Yellow, is the signal connection. It is prudent to make the connection through a 220Ω resistor to limit the current draw on the controller. While the limited rotation may be of little use to mini-sumo robot builders, a servo can be modified to give continuous rotation and a simple drive mechanism. Servos differ by manufacturer and model but the modifications required are similar. Disconnect and fix the feedback mechanism. Note: To carry out the modifications you'll need to get inside the servo, these changes are not reversible and will invalidate you servo warranty. A few hand tools are required: a small screw driver and a sharp craft knife. Other tools will depend on how the feedback is fixed, more detail to follow. The screws fastening the servo together give access to the controller at the bottom and gear train at the top of the assembly. There are a number of options for fixing the feedback. You can see in the picture to the left "brass" end to the Potentiometer (pot) that connects to the output shaft. This pot gives the control circuit feedback on the position of the output shaft, disconnecting it will break the control path and push the drive toward continuous rotation except when the signal matches the pot's location. Some servos have a small clip inside the output shaft, when this is removed we stop the shaft turning the pot. Others have a cast shape which we can drill out to give the same result. When following this method we should connect the servo to a power supply and send the centre pulse signal, the motor will probably turn until we centre the pot. Once done we can drive the servo motor forward, reverse or stop it by using the clock-wise, anti-clockwise and centre pulses described earlier. This method has it's draw backs, the pot may be nudged off centre or fail by other means. As the feedback drifts the motors start to creep away from the stop position in a way that cannot be predicted. In this picture we can see the Servo Controller wired to the motor and pot, in some models the motor and pot mount on the PCB directly. We can replace the pot with a potential divider, a pair of resistors in series with a centre feed where the pot's centre feed would be. In this case the pot was 5.4KΩ, replaced by two 2.7KΩ resistors to give an equivalent to a centred position. This mod can be done easily with a soldering iron and couple of resistors, a solder sucker or de-soldering braid can help remove the pot. When using a pair of servos back to back for a sumo robot drive you'll forward motion requires one to be driven clockwise while the other is anti-clockwise. To use the same "direction" pulse on each servo for forward motion it's worth swapping the motor connections on one of the servos you modify. The final modification allows the output shaft to rotate freely. The picture to the left shows the gear with the "stop" trimmed removed, the remains of the stop can be seen by the arrow, in this case trimmed with a sharp craft knife. With the servo re-assembled we have a simple drive for our mini-sumo robot with direction control by mean of a single wire to our controller. We will consider the programming separately but if you've got a particular servo to modify an internet search will probably find some detailed instructions - certainly for the popular models. General Servo Manual - Hitec RCD USA, Inc.
General Servo FAQ - Hitec RCD USA, Inc. 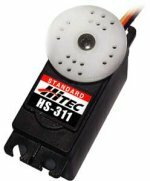 Thanks to Hitec RCD USA, Inc. for their kind permission to reproduce their HS-311 servo picture for the purpose of this application sheet.